Printrbot has finally revealed information on the new Go V2’s. They will be coming in 3 different sizes ranging from small to huge. As we speculated a few months ago, it will have larger rods, more motors and aluminum bearing blocks. The huge size as well as the others offers print space that is actually usable. Most manufacturers brag about z axis height but, once you get to a specific size its nothing that a person would actually use. I have a fairly large print space on my heavily modded Plus V2/V2.2 hybrid. The majority of the space I use is in the x and y axis as I often print lots of smaller objects at one time versus printing one really large item. Stepping up the size is only part of the game as the majority comes down to the quality of parts and how they are assembled. Printrbot has always used quality parts and a good portion of those parts are done in house so that they can make sure those parts meet their standards. Working extensively with the only other Go V1 owner in the US. I understand why the Go V1 was taken off the market. The concept was great but the design wasn’t quite there yet. Brook took the time to go through the design to create a well thought out and quite impressive lineup of Go V2’s. 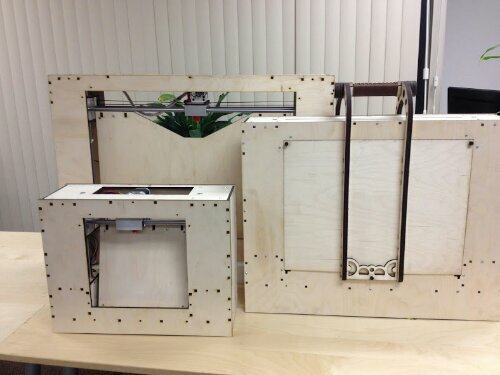 The limited edition Printrbot Go family. Go small, medium or Large for $1299, $1499 or $1699. 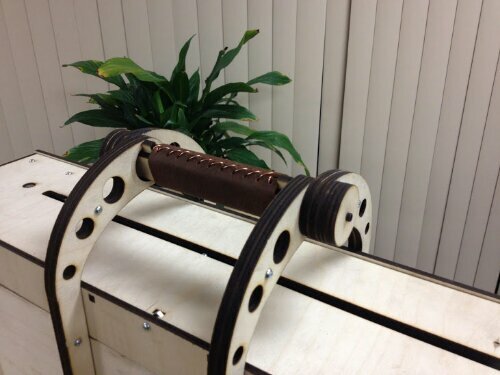 The Large is 24″x12″x12″ and will have triple extruders, the medium is 16″x8″x8″ and will have double extruders. All have a Raspberry Pi on board and are battery ready. All will have 12mm bars all around, lots of machined aluminum & glass print beds. The medium and large have dual x, y & z motors. Why make these? I wanted a large printer that travels well and sets up to print fast… Maybe a few of you out there want one too. The small fits into a carry on Pelican case perfectly. I’ve been jealous of other large printers but wanted width instead of height. The cool thing is they all fold up for minimal impact on your desk or storage. I don’t like huge boxed printers that have massive visual impact and near the two-man-lift territory. I don’t take these too seriously, the big ones verge on ridiculous but I give myself permission to explore fun projects. Did I mention the medium one is completely finished and prints beautifully?! I can’t wait to print some massive prints and see what’s possible with three extruders. Adding dual extruders to the plus is nice, but this huge real estate on the medium and large offers no compromise in print size from dual and triple heads. I refuse to use Bowden tubes so direct drives will so it. I’ll get them up for sale tomorrow (fingers crossed) with a 1-2 week lead time -based on current orders on the cue. Let me know what you think. These are ancillary to our main line up, so very little risk if they don’t sell. The Large isn’t meant to compete with MakerBot’s Z18, but I am proud of now having the largest printer out there with a price that cleanly puts it in the value category. The price to print size ratio is pretty good I think. It won’t disappoint me if people compare the ratio to the Z18, but these are on the hacker category not the “prosumer” or “industrial” category… Whatever those mean. I’ll post pics and videos next week of prints, performance and all the features. Brook from Printrbot just hinted to the fact that the new GO will have all the goodies that the new Plus V2.1 has. It sounds like the new go will be essentially a portable Printrbot Plus. As of today they are working on the folding mechanism. Still no word on price, options or design but I will update as I here of progress. Also on a side note, we would be dumbfounded if the new Go didn’t come with a dual extruder option. The Printrbot GO V2 has been confirmed but, as of now only as a limited release. No shipping date has been confirmed. Check back for updates as they come out. Recently the Printrbot GO was taken off of the Printrbot webstore. Brook, the owner of Printrbot made another owner of the GO aware of the re-working and upgrade of the GO. 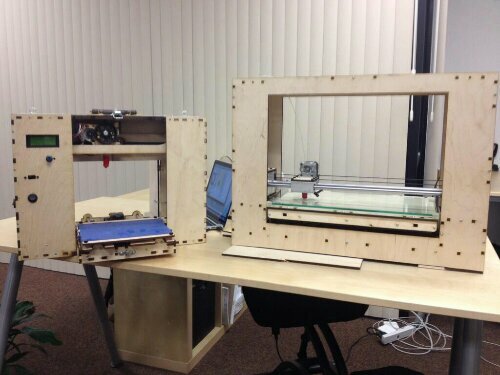 It is a great platform that diserves to evolve along with the rest of the Printrbot line up. The GO is an often forgot about big brother of the Printrbot team. It looks like the GO might possible get a triple extruder setup that is currently being built. The UBIS hotend was built with the triple extruder in mind.